2-Hole Security Screws (Otherwise known as Snake Eye or Pig Nose) are designed for low to medium torque applications. They have two holes drilled into the head which require a unique 2-pin driver to install and remove. With an aesthetically pleasing head design, they are often specified by architects and designers. 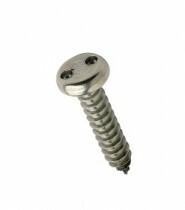 Available from stock in both Self Tapping AB Type and metric machine screws.